With his sincere, vulnerable delivery and earthy, evocative lyrics, deejay-singer Lutan Fyah has been at the vanguard of modern roots reggae during the last decade. Growing up around the family sound system, he chose music over a brief professional football career, apprenticing under Buju Banton at his Gargamel studio. He rose as one of the 2000s’ second wave of fiery, turban-wearing Rastafarian artists and has kept bubbling away, maintaining a presence without becoming hyped. A self-confessed workaholic, he has scattered his singles recordings amongst numerous different producers worldwide. His albums thus far have been of variable quality – although never poor. The best is probably 2006 Greensleeves release Phantom War – which, despite being a compilation, was very unified in its rootsy feel. With the right focus and producer he clearly has the talent to enter the premiere league. In June English label Jah Warrior released Never Surrender My Faith - a collection recorded when Lutan came to England in 2000 - which ably showcases his harder, raspier side atop heavy UK dub. He has also been working on a straight roots and culture album with St Croix I Grade records: planned for this year but now postponed until 2014. It makes way for this project, his tenth, cut over 16 months with old friend from Jamaica, Khabs “Grillaras” Bonner (for whom Lutan sang Rasta Better Off on the 70s steppers inspired Good Times rhythm back in 2004). As his name suggests, Bonner is a distant cousin of Richie Spice, however he didn’t meet him until they linked musically. He got the nickname “Grillaras” because of his serious countenance and professional drive. Bonner prides himself on approaching each assignment afresh. This one successfully synthesises his love of two so-called golden ages: 90s jazz and soul sampling hip hop and the 70s reggae of the Good Times. Mercifully free of cheap sounding elements, the backings are roots in spirit but morph at their edges into rap, dubstep, rock and more. Due to careful, collaborative songwriting and the two friends’ natural chemistry, a sense of unity and purpose is maintained. 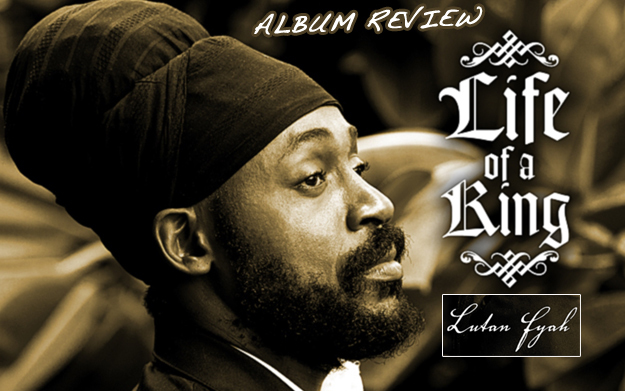 The title track – which views the Life Of A King as one of Rasta responsibilities rather than material riches – garnishes blunted meditative beats with a cascading harp. The muscular guitar of Economical Crisis gives a lesson in how to blend rock into reggae without spoiling the pot. Cyaan Do We Nothing pulls off a similar trick with the golden tones of Chronixx and dirty rave bleeps. And there is also proper roots music in Leave the Herbs sparse dubby mix and crisp horns. Brass also figures in Protect The Youth: an unlikely combination with deep voice of dancehall Mr Lexx which samples Money The Root Of All Evil by Horace Andy. Even the sole concession to pop reggae Let’s Come Together featuring ultra-emotive singer OJ has compensatory Bunny Lee “flying cymbals” drums. Lutan Fyah has crossed into these areas before: riding the Still Dre rhythm for France’s Irie Ites and voicing for dubstep producers Rusko, llloom and Don Goliath. Yet this record sounds current in today’s climate of Jamaica’s new generation of roots-reggae-meets-backpacker-hip-hop-heads – who followed the template of Junior Gong. This is exactly the kind of well assembled, complete project we like to hear from Lutan Fyah. And with the I Grade release plus a potential Midnite collaboration in the works, there could be more to come. Life Of A King is his best album since Phantom War and one of the stronger releases this year.